Here's how to fold a napkin shirt. You'll need to press all your creases, so get out your iron. Or just use paper napkins and skip the ironing. 2. Fold the left edge to the center, then the right edge. 3. Turn the napkin over. Fold about one inch down from the top. 4. Turn the napkin over again. Fold each of the top corners diagonally inward to the center. This is the collar. 5. Lift each bottom flap and fold outward, making a crease that's roughly parallel to the collar fold above it. These are the sleeves. 6. 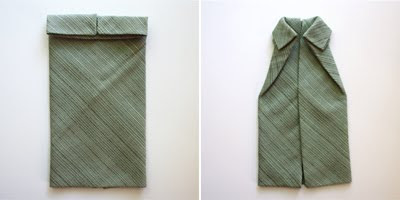 Fold the entire bottom half of the napkin upward toward the collar and tuck it under the collar flaps. Awesome, I did this with paper, but so great for dinner on Sunday!!! Thanks for sharing! Fun! 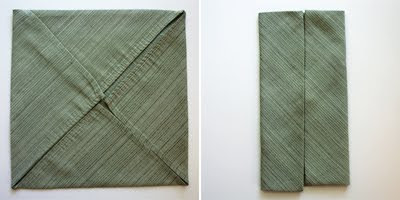 I love learning new ways to fold napkins (because I'm a dork like that) and I have those same napkins! OK well this is about the cutest thing I've ever seen. Just made one out of paper. omg, that is awesome! My husband usually mocks napkin arrangements because they tend to be so floral or feminine. But this is definitely NOT. Very cool and I'm absolutely going to make up a stack of these for our father's day BBQ! That's awesome! I can't believe the things people come up with! Very, very cool!! Great tutorial too. The pictures make it goof proof. Thanks for sharing. Awww that's so cute! Maybe I can get the kids to make! Love! Such a cute idea... I have actually been looking for cute Father's Day ideas! Thank you - I am going to make some for our Father's Day b-b-q! They are so adorable! i love this blog so much! thank you so much. adorable! and i think we might even be able to accomplish this. Linked to this post this weekend. Oh my lands! That is adorable! 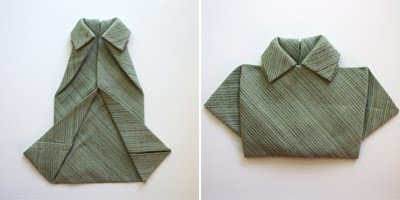 I'm pretty sure my dad has a shirt that is almost identical to the folded napkin, including that pattern. I would like to thank you so much for this post. 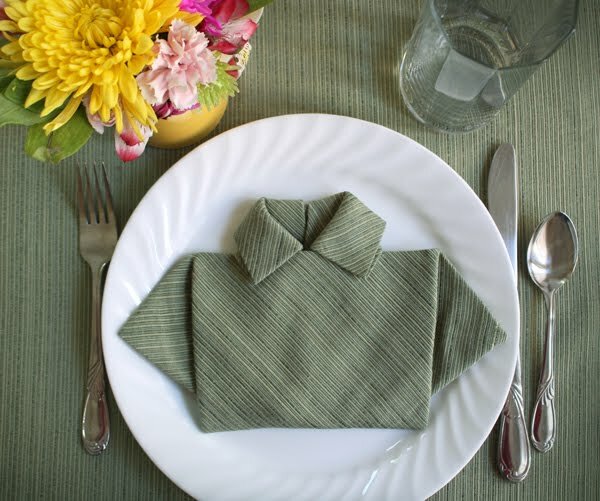 It sounds like many people got enjoyment out of it on Father's Day, but after seeing it I used the pattern this weekend to fold tropical patterned napkins into tiny Hawaiian shirts for a memorial for a dear friend of mine who loved anything tropical. It just blew everyone away and some people even took some home of a souvenir. It added some beauty to an otherwise painful event, so I thank you for sharing it. Amanda, I love that story. Thank you for telling us. I made these with light blue and spring green napkins for our dinner on Sunday and everyone thought I was a creative genius! Thanks! Again, I thank you for adding to my necessary life skill repertoire. Between this and toilet paper origami I am set for life. Clever, clever, clever and so cute! I once got money for my birthday folded like that. So fun! Funny! i'll try to remember this next year... can you remind, please! so cute! follow my blog!! Love these--thanks for sharing the tutorial! I tried this! So hard!! Unfortunately it was a bit hard for me and i couldn't work it out but i've got a thin napkin... Any ideas?? Practice makes perfect! Keep trying or look for a step-by-step video on YouTube. Maybe somebody made one.